There was a good few-year stretch where I never would have doubted the Giants were going to win Sunday’s game, but last season scarred me. I’m not talking about the kind of scar that fades with time, I’m talking about an open-heart surgery scar where every time you look in the mirror without a shirt on you’re reminded of what happened: a 6-10 season that could have been a 13-3 season. And with 1:05 left in the game, and the Giants leading 20-19, Dak Prescott and the Cowboys took over at their own 20 and I could feel the beginning of a panic attack. I watched most of Sunday’s game in silence. Part of that was because my girlfriend and dog were passed out on the couch and I didn’t want to wake them up and the other part of it was that I couldn’t believe what I was watching. The Giants were Giants-ing away a game that should have never been close with an abundance of runs, a missed extra point, a defense that couldn’t get off the field and a typical Eli Manning interception (though it seems as though Sterling Shepard ran the wrong route). So I sat on my couch in silence for nearly three hours and watched the Cowboys continuously kill the clock starting back in the first quarter in a first quarter that felt faster than Super Bowl XLII. I had a bad feeling about what was going to happen because I had already seen this game before. The way I recite the lines of Slap Shot or Dumb and Dumber, I could tell you what was going to happen on Sunday as if it had been scripted. I could have cared less about the -1 with 1:05 left (thanks, Randy Bullock) though I obviously was ready to sign up for a push. Covering a spread no longer mattered because all I really truly want is to have a football season this year. Not the kind of season we have had for the last four years either with bad starts, disastrous losses and second-half collapses, I mean a real season with wins in winnable games and a minimal amount of frustration and disappointment. Stopping the Cowboys with 1:05 and no timeouts would go a long way to accomplishing that goal. With 35 seconds left and the Cowboys facing a third-and-15 from their own 31, Prescott hit Cole Beasley for exactly 15 yards and I thought I was going to be sick like bad sushi sick. The Cowboys were now at their own 46 and with Dan Bailey, I was thinking I would watch the Giants lose on a 60-yard field goal, which meant the Cowboys needed only 11 yards to set up that chance. On second-and-10, Prescott threw a pass for Jason Witten, who will forever try to ruin my life, but it fell incomplete. And then came the play. Prescott found Terrance Williams wide open on the right side of the field with a clear lane to the sideline, but rather than go out of bounds and stop the clock to set up just under a 60-yard attempt, Williams stayed in and tried to make a few extra moves to pick up extra yards. The only problem was the Cowboys had no way to stop the clock and as they raced to the line to try to spike the ball, the clock ran out. Giants win! Theeeeeeeeeee Giants win! No, I didn’t think the Giants with their franchise quarterback now in his 13th year in the league and their three-headed receiving monster would need a Terrance Williams brain fart to beat the Cowboys and their rookie quarterback in his first career game. Then again, I’m the same person who has been pulled back in by the 2016 Yankees about 39 different times even though I know what’s likely to happen to them over these next three weeks. I’m easily fooled and I was fooled again that a new head coach might change who the New York Football Giants are. But now I know, no coach is going to change that. There’s no difference between the Ben McAdoo Giants and the Tom Coughlin Giants. 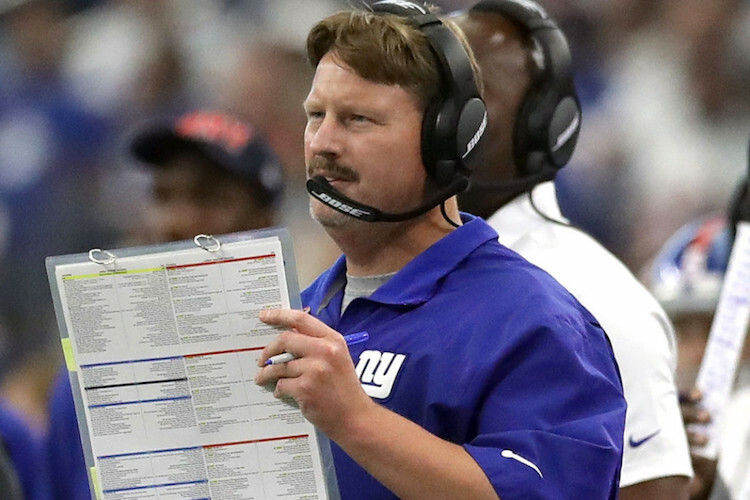 Sure, the former Giants head coach was a now- 70-year-old drill sergeant and one of the most intimidating motivators in the game and the new Giants head coach has a haircut and facial hair someone who thinks it’s still 1986 and has the persona of someone who only eats at T.G.I. Friday’s, Chili’s, Applebee’s and Ruby Tuesdays, but aside from that, they are the same coaches. The only true difference is that the Ben McAdoo Giants completed a fourth-quarter comeback the way the last version of the Tom Coughlin Giants couldn’t and that’s why the Giants are now Ben McAdoo’s and not Tom Coughlin’s. I would have liked more Odell Beckham Jr. and less Rashad Jennings and I would have liked more passing plays than running plays on first down and I would have liked the Giants to not have to eek out a one-point win against an inferior opponent and first-game quarterback, but that wouldn’t be Giants football. And Giants football is the same with Tom Coughlin or with Ben McAdoo. The Giants can change the head coach and tweak the coaching staff and roster, and they can change stadiums and the color of their uniform pants, but it won’t matter. The Giants are always going to put their fans through a mental, physical and emotional grind each week and each season and leave them questioning why they do this to themselves and if they even enjoy football. That’s just who the Giants are. Giants football is always going to the same and the Giants are always going to turn in performances like Sunday in Dallas. I can’t wait to do it all again next week.